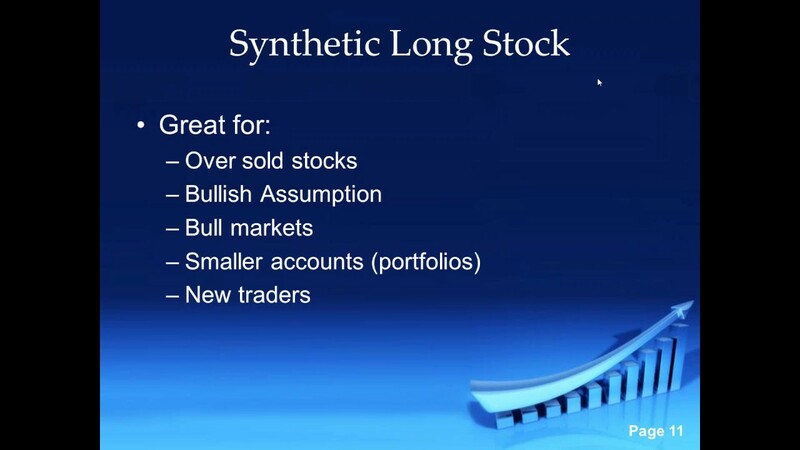 Among the many options strategies, one of the most interesting is synthetic long stock. This combines a long call and a short put opened at the same strike and expiration. The name “synthetic” is derived from the fact that the two positions change in value dollar for dollar with changes in 100 shares of stock. The cost to open the position is close to zero and may even produce a small credit. In both examples, the closest to the money strikes were used. Both yielded $18 net credit to open the positions. The differences between strike price and dollar value is estimated as $5 for trading fees. A period longer than two weeks could have been used as well. 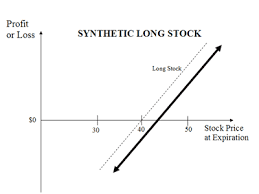 Because synthetic long stock involves buying a call and selling a put, longer-term positions do not present the time value problem usually faced by options traders. For example, with the net credit close to zero, the position combines to provide exceptional leverage, control over 100 shares not only for no cost, but for an $18 net credit. The changes in value will mirror movement in the stock as it moves, point for point. The call’s intrinsic value above its strike is going to be one dollar higher for each point of movement in the stock. 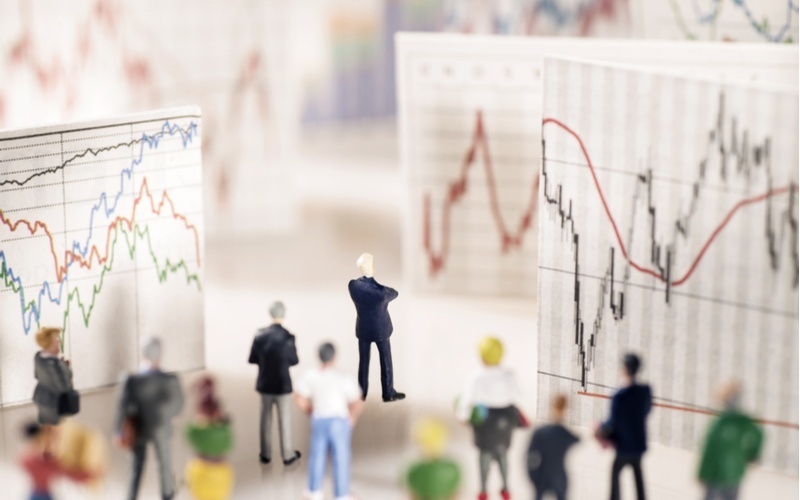 If the stock moves downward, the put gains one point for each point lost in the stock; and because the put was short, this represents a loss – in fact, identical to the loss of just owning the stock. The options are likely to track closer to movement in the stock because time value is going to disappear fast, and extrinsic (volatility) value will be less of a factor in overall premium value as expiration approaches. The market risk in synthetic long stock is the same as that of owning 100 shares of the stock. However, in this example, owning shares costs $8,200 for WMT, or $3,500 for M, either of which can be bought for 50% on margin; and the short put is subject to margin requirements equal to 20% of the strike values. This means the short put margin cost is lower than the stock purchase cost. Losses in the short put are mitigated by closing the position, rolling it forward, or buying a later-expiring long put. Losses in long stock cannot be managed in the same way. Losses have to be taken or waited out. Holding the short put represents the primary risk in the position. However, this is the same downside risk as owning 100 shares of stock. The net cost to open the position is close to zero until the collateral requirements are considered. On a practical level, the most likely outcome would be to close the short put once it becomes possible to take profits, and leave the long call to appreciate. This is the best of both worlds: low-cost call with profit potential paid for by a short put position. The market risk of an uncovered put is identical to the risk of a covered call. Combined with the limited risk of the long call, this makes synthetic long stock a very conservative trade. Synthetic positions can also be opened on the short side, combining a long put and a short call. This may seem higher-risk than the synthetic long stock; but it can be made more conservative by covering the call. But as long as the call remains uncovered, synthetic short stock is higher-risk than synthetic long. Synthetics are intriguing and interesting. They provide the possibility to profit from stock price changes, without needing to buy shares of stock. The offsetting cost/income also makes it practical to use long-term options without needing to worry about time decay. This affects both sides equally, meaning there is no net effect of decay during the period the position remains open. How much ITM can the short put be before closing the synthetic long stock position? Rolling forward means future expirations? Buying a later-expiring long put without closing the position at the same strike? Assignment risk on the short put? For example is this strategy good now for Illumina stock? ILMN is not over sold but i am bullish. That's really up to you. If you allow the options to go too deep ITM, you risk assignment (which is not a bad thing by itself, unless you don't have enough funds). Yes if it becomes too deep ITM. It can be used on any stock that you are bullish on. Buying a later-expiring long put without closing the original position? Yes because you want to hedge the original position. is there a way of synthetically be long say 30 shares of a stock? 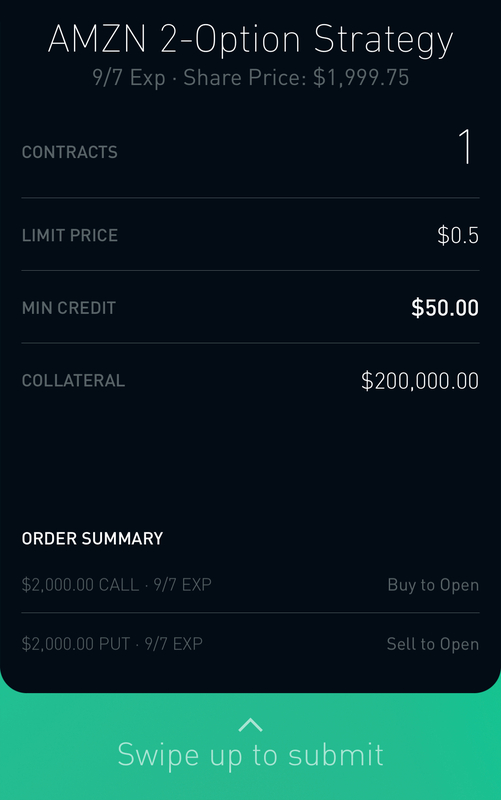 When I tried to use this method to buy a synthetic amzn at 2000, the system asked for 200K collaterals (see attachment). So it does not make a difference between the synthetic stock and buying 100 stocks. Is there a way to reduce the collateral? Thanks! Yes, but currently I see mini options only on SPX, DJX and NDX. ATM, OTM or ITM put? 1 long put for 1 synthetic long position? 1 long put gives me the right to sell 100 shares at the strike price, but 1 ATM put has a delta of 50, so is 1 put only for 50 shares? This is what i also see on CBOE under Products/Mini Options. On March 18th, all of the major option exchanges began trading mini options on three stocks and two ETFs (AAPL, AMZN, GLD, GOOG, and SPY). A mini option is an option on 10 shares of the underlying instrument. They trade with a slightly different symbol. For the time being, the symbol for the mini-option is merely the regular underlying symbol with “7" at the end (AAPL7, AMZN7, etc.). If we change the contract size in the options chain window to 10, then we should see the mini options but not all brockers allow this. This is post from 2013. I think they discontinued those mini options since then. Losses in the short put are mitigated by closing the position, rolling it forward, or buying a later-expiring long put. closing the position: the entire synthetic or just the put leg? buying a later-expiring long put: why later-expiring?